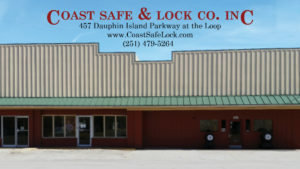 Coast Safe & Lock | Protecting Your Business is Our Business. Welcome to Coast Safe & Lock, Mobile’s Locksmith & Security Experts. Welcome to Coast Safe & Lock — Your Premiere Locksmith, Security System Experts, and Safe & Vault Specialists. Whether you need durable hardware or cutting-edge technology, Coast Safe & Lock delivers. Our team is proud to serve as the professional locksmith to hundreds of businesses in Mobile and the Gulf region. We work with industry leaders that supply dependable equipment and innovative technology that makes us proud to be Mobile’s leading locksmith. Coast Safe & Lock – Mobile’s Locksmith. Coast Safe & Lock is insured and bonded. We are licensed in the State of Alabama (#1102) and with the Alabama Electronic Security Board of Licensure (AESBL). 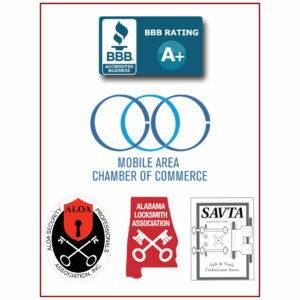 The Better Business Bureau has awarded us an A+, and we are proud members of the Mobile Area Chamber of Commerce. Most of our locksmiths have worked with us for decades. Each one passes a background check and drug screen test. They complete continuing education units each year to maintain their licenses. Mobileans know them as friendly faces and members of the community. Folks will tell you that Coast Safe & Lock is the place go for friendly, professional service. And be sure to look for our sticker on the door of countless local businesses. Since 1972, we have served hundreds of clients throughout Mobile and the Gulf Region. Over nearly five decades, local business leaders have trusted us to protect their assets. From cutting keys to commercial security, clients rely on Coast Safe & Lock to protect their homes and businesses. One of our locksmiths will meet with you to talk about your security goals, identify any weak spots, and decide which system is best for you. First, you will want to protect your staff and clients. Next, you need to guard your property, assets, and inventory. Whether this calls for a general locksmith or a sophisticated security system, Coast Safe & Lock is ready to help. Whether we are installing a new lock or wireless access control, we work with you each step of the way. Once installed, we demonstrate how to engage and disengage your new system. Afterward, we remain available to answer your questions, maintain equipment, and provide system upgrades. Our business is to protect your business! Contact Coast Safe & Lock today to learn more.